Drums of the Dragon Part One: The Drums! On June 12, 2016, Midnight Taiko will be writing taiko history in Calgary! 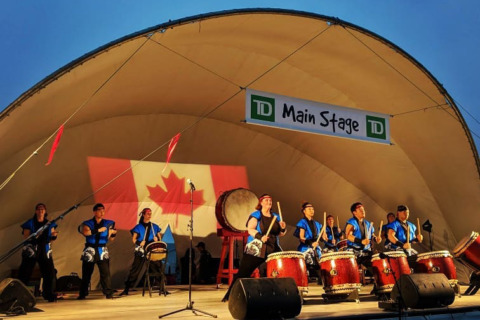 For the first time in our city, our taiko players will be performing alongside musicians of the Calgary Wind Symphony, in a joint concert entitled DRUMS OF THE DRAGON! The drum is placed on a flat stand and played in an upright position. This style is commonly taught to beginner taiko players, and this is the style that Midnight teaches in our Beginner Taiko workshops! The drummer is seated on the ground with the drum placed between the knees on a low, slightly angled stand. The drummer must lean backwards to strike the drum. This style is demanding and requires considerable core and arm strength. The drum is placed horizontally and very close to the ground. Two drummers play a single drum on both sides of the drum. This stance is also very demanding. The drum is also placed horizontally but at chest height. Similar to miyake-style, two players play on opposite sides of the drum, but is very different style and choreography than miyake. Taiko drumsticks are called bachi. 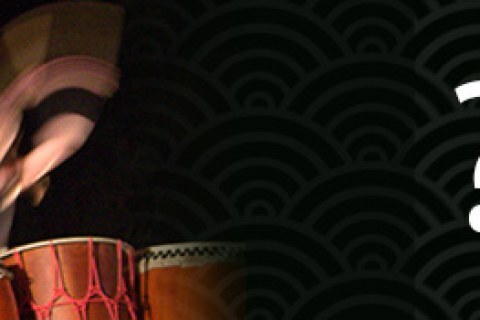 The size and material of the bachi can vary, depending on the size of the drum, and also the style of taiko that is being performed. For example, chu-daiko bachi are typically made from a hardwood like kashi oak, or Japanese maple. They are medium-sized, compared to the much larger odaiko bachi, and the skinnier shime bachi. The word “O-daiko” translates to “big drum”, and generally refers to the largest drum in the ensemble. Midnight has recently purchased a new hiradaiko to play Odaiko. This drum is very heavy, and requires several people to lift! Although the odaiko can also be played in a flatter position, Midnight Taiko currently plays Odaiko in an upright position, with very large bachi made from a lighter wood such as cypress or hinoki. The smaller drums seen in Drums of the Dragon will be the shime-daiko and the larger okedo. These drums have skins that are not tacked to the body of the drum, but tied to the opposite skin and tightened using rope or metal bolts. Odaiko can be as large as a few meters across and are exciting to watch! It is usually played solo with one drummer, but can also add a lot of depth and sound in a group ensemble. Okedo can be played on a simple floor stand or worn on a sling and played while dancing or moving about the stage. It’s a versatile, two-headed drum that can add a lot of visual excitement to a performance. Shime are smaller and have a higher pitch. They are often used as a time-keeper to keep the taiko ensemble together as well as providing accents and a sharper sound for faster pieces that require precision. We'd love to hear your comments. Your email will not be published. If you are interested in booking us for a performance at your event, please contact our booking agent at bookings@midnight-taiko.ca.